Two Bears Farm and the Three Cubs: Is Your Child Angry? Make Cookies! Is Your Child Angry? Make Cookies! With most recipes it seems like kids need extra help, but this is one recipe that even fairly young children can make on their own - the only help needed is with the oven. 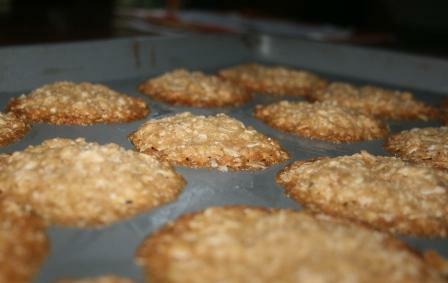 It's a great recipe because making these cookies burns a lot of energy - in fact, they are called Aggression Cookies. If your child is having a bad day and needs a distraction, this is a great go-to activity. The recipe is from The Preschooler's Busy Book (this book is a great resource for Mom's - I love it!). 1. Dump all the ingredients into one bowl and let your child really go at it! 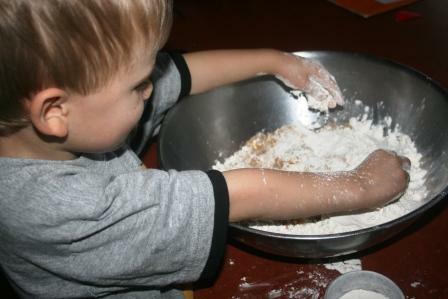 Pound, punch, knead the batter - the longer and harder the dough is mixed, the better the cookies will taste! 2. When ready to bake, preheat the oven to 350*. 3. Roll the dough into small balls and bake on an ungreased cookie sheet for 10-12 minutes. These aren't the prettiest cookies on earth, but they taste quite good, and Pierce was so proud of himself for making cookies all on his own. Comment #15 - Josh & Teddie - won the Shaklee giveaway! Congrats! Once I get your mailing address information I will get the information to the sponsor. Thanks so much to all of you who entered! I loved hearing about all of your favorite green products. um. idk if the aggression cookies will help in this household. my girls like to scream. punching dough will not remove that. What a great idea. I'll have to remember it. and with the trampoline, my parents went in on the gift with us too, which made it an affordable gift for both girls : ) definitely recommend one .... get the biggest too so it will last as your boys are older. Love these cookies! And cooking with kids I totally understand. It's a part of our lives and I think my kids will appreciate it more when they are older. For now we make a lot of messes! Enjoy your weekend. Great post, Lisa. Pierce has the cookie-making technique down!! What a great idea for little ones (and not so little ones!). I'll pass this on to my mom buddies. Audrey loves to bake too. I think it is good. Nice post. What a great idea. And they do look VERY good! I'm hopping on over to Amazon now to check out this book!! Aggression cookies huh - I am going to copy and save this one! I'm going to have to try this with my kids when they're bored!